Zion Market Research has published a new report titled “Operating Room Equipment Market by Product (Anesthesia Devices, Endoscopes, Operating room Lights, Operating Tables, Electrosurgical Devices, Surgical Imaging Devices and Patient Monitors), For Hospitals, Outpatient Facilities and Ambulatory Surgical Centers: Global Industry Perspective, Comprehensive Analysis and Forecast, 2016 - 2022.” According to the report, the global operating room equipment market accounted for USD 25.75 Billion in 2016 and is expected to reach USD 38.86 Billion by 2022, growing at a CAGR of around 7.1% between 2017 and 2022. Operating rooms are specialized workspaces that equipped with highly functional equipment of the highest quality, which surgeons and other operating room personnel use to perform lifesaving procedures (Surgeries). Increasing preference for minimally invasive surgeries such as cardiac, gastrointestinal, ENT and etc. which require operating room equipment are further expected to foster the market demand for operating room equipment in coming five years. These minimally invasive are not only also cost-effective but also reduce the patient stay duration during pre and post procedures/operations. In addition, aging population coupled with the increasing incidences of chronic diseases is also expected to propel the growth in this market in coming five years. For example, according to the U.S. Census Bureau, cardiovascular disease, lung disease, cancer, and stroke are the leading killers of the population aged 60 and over. Major growth drivers for the operating room equipment market are increasing geriatric population coupled with growing incidences of chronic disease, increasing awareness about the effectiveness of minimally invasive procedures. In addition, increasing number of ambulatory surgical centers and a large patient pool for surgeries, improving healthcare infrastructure and affordability of the patients are also anticipated to fuel the growth in this market within the forecast period. Furthermore, increasing investments for technological advancements in this field are also supplemented the market growth within the forecast period. However, the high cost of the devices is expected as the major barrier to the growth of this market. However, emerging markets in developing countries can be an opportunity in this market. 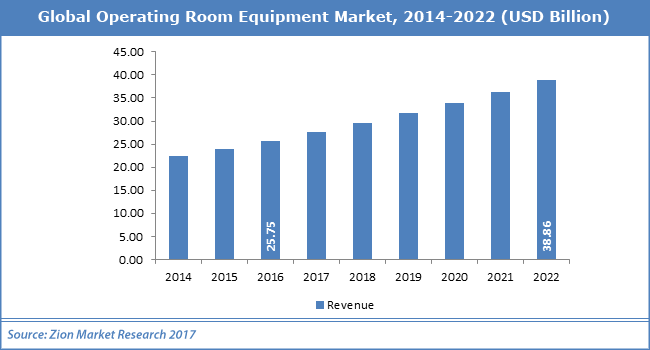 The operating room equipment market is segmented on the basis of product, end-user, and region. Product segment is categorized into; anesthesia devices, endoscopes, operating room lights, operating tables, electrosurgical devices, surgical imaging devices and patient monitors. In this segment, anesthesia devices are expected to attribute to the largest market share within the forecast period. The endoscopes are expected to show the fastest growth in the coming five years owing to increasing awareness about minimally invasive procedures and patients’ inclination towards endoscopic procedures. Based on end-user, the global market for operating room equipment is segmented into hospitals, outpatient facilities, and ambulatory surgical centers. Hospitals have accounted for the major share of this segment in 2016 owing to the increased investments in healthcare infrastructure & use of advanced technologies. However, ambulatory surgical centers are expected to witness the fastest growth within the forecast period owing to increasing demand from healthcare participants in surgical care such as; healthcare professionals, patients, and insurers. In addition, increasing demand for patient satisfaction, cost-effective procedures and efficient practices by healthcare professionals are also expected to boost the growth of this market within the forecast period. In terms of geography, North America is expected to capture the major share in this market within the forecast period owing to increasing number of ambulatory surgical centers and increasing prevalence of chronic diseases. In addition, well-developed healthcare infrastructure and rising demand for minimally invasive surgeries are also anticipated to boost the growth in this market. North America is expected to follow by Europe and the Asia Pacific in this market within the forecast period. Asia-Pacific is expected to show the fastest growth in this market owing to the rising awareness about the minimally invasive surgeries and improving healthcare infrastructure. In addition, increasing healthcare expenditure and growing number of hospitals & healthcare facilities and government support in developing countries of this region has also boosted the growth in this market. Latin America and Middle East & Africa operating room equipment market is estimated to show a healthy growth within the forecast period. Some of the key players include in plant growth market such as Stryker Corporation, STERIS Corporation, GE Healthcare, Getinge Group, Hill-Rom Holdings, Inc., Drägerwerk AG & Co. KGaA, Mizuho OSI, Philips Healthcare, Medtronic, Inc. and KARL STORZ GmbH & Co. KG among others.